The McCrery-Pomeroy SSDI Solutions Initiative is a project dedicated to identifying practical policy changes to improve the Social Security Disability Insurance (SSDI) program and other policies for people with disabilities. Launched in 2014, the initiative originally commissioned a number of accomplished policy experts from a variety of backgrounds to put forward 12 different policy proposals, each addressing a unique issue with current disability policy. 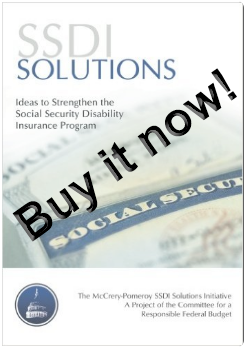 These papers were peer-reviewed, presented at the Initiative’s 2015 SSDI Solutions Conference, and ultimately published in the 2016 book SSDI Solutions: Ideas to Strengthen the Social Security Disability Insurance Program. The Initiative’s work helped to elevate SSDI to the attention of policymakers and has led to the proposal, enactment, and implementation of numerous legislative and regulatory improvements. Beginning in 2018, the SSDI Solutions Initiative commissioned seven additional papers designed to build upon the work of the 2016 book. These papers will present additional research, offer implementation guidance, or offer new ideas to further improve disability policy in the United States. The SSDI Solutions Initiative is co-chaired by former Congressmen Earl Pomeroy (D-ND) and Jim McCrery (R-LA), both former Chairmen of the House Ways & Means Social Security Subcommittee. The SSDI Solutions Initiative is a project of the Fiscal Institute at the Committee for a Responsible Federal Budget. Read more about the SSDI Solutions Initiative. You may contact us by sending an email to info@crfb.org.